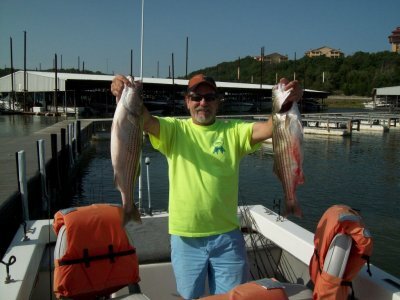 We have revisited this topic once every couple of years as we continue to receive email fisherman who don’t think they were treated fairly by the guide they booked for a Striper fishing trip on Lake Texoma. The biggest issue is centered around the use of phrases of terms “Guaranteed Catch”, “Catch fish or your money back. 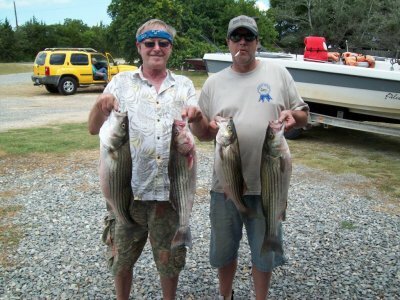 Do a Web Search for Lake Texoma Striper Guide and you will find results in the Sponsored links section. 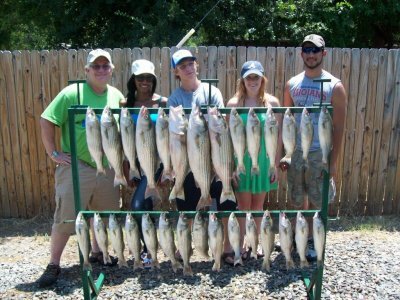 Before you book a trip ensure you are getting what you understand exactly what the terms of your booking and you will receive to make sure you have a fun fulled day fishing. Be sure to ask questions such as “What does Guarantee to catch Fish” mean. Not to say that the guides using these sales pitches aren’t very good guides and that you won’t catch fish, most are excellent guides, but…. understand that fish is used as the singular and plural tenses, ie.. “Wooohooo, I caught a fish.”, “We had fun and caught a box full of fish”. We have been told of of guides who on bad fishing days, holding customers to the guarantee once they caught “ONE” fish. We also know of some guides that are true to their word and will take you out another time if fishing is so bad you spend 5-6 hours and only catch a one or a couple fish. Some guides also will re-fish you at a reduced price. Also be sure to ask about the time you are allotted to fish. Most guides specify this on their web sites and will tell you if asked. Ask what happens should you catch your limit in an hour and you would like to fish some more. Some will whisk you immediately back to the marina, others will take you catfishing, etc. Once you have caught your limit of stripers most won’t let you keep fishing for them, but there can be alternatives. Another area to ask is if you will be fishing with the advertised guide. Some guides are multi-guide operations and will publish who their guides are. Others are one man operations and the guide on the site is the one you will be fishing with, however there are some who use part time guides as fill ins. The part time guides may or may not have an excellent knowledge of the lake. 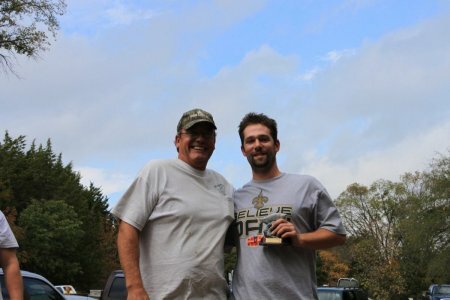 We have heard many stories of part time guides who don’t really care how the trip goes as they are not the one you are paying and they figure they will never see you again anyways, The point we are trying to stress is that you should know who you are paying to fish with and not be blind sided at the dock. Take your time and look at several of the guide’s web sites , don’t be afraid to go 2-3 pages deep in the search (the above term resulted in “about 25,000 results”). There are numerous guides that don’t do the Sponsored Link program that are excellent guides but for one reason or another choose not to advertise as a Sponsored Link. Make calls or email the guides. They will be happy to talk to you about their services. Remember you are the customer and as any other purchase you make, know what you are getting before you get in the boat. If you would like a referral to a guide we would pay to go fishing with, email us at laketexomadesigns@yahoo.com and we will help you get your trip booked. Fished Jeff Reynolds and friends. We left Highport Marina at 7 am. We didn’t catch out first fish until 9:30. The deep water fish moved but I was able to find them after 2 plus hours of looking. Gotta love Lake Texoma. 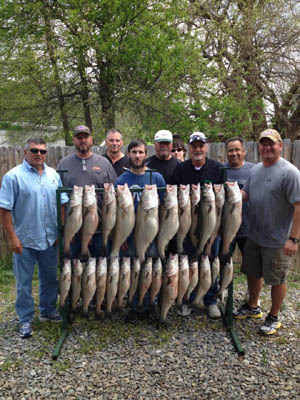 Lake Texoma striper fishing the past several weeks hasn’t changed a whole lot. 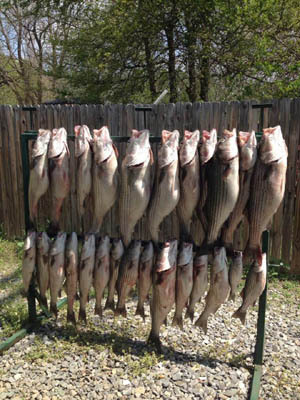 Lots of hungry stripers still staged in the 40-60 ft. of water. Seagulls are working in several different areas and producing nice boxes of stripers on our morning and afternoon trips. Lake Texoma elevation is 611.85 and water temperature is 52 degrees. Most of the trips I’ve had the past few weeks I’ve fished live bait with a little lure fishing in between. I’ve had days where you can sit on anchor and the stripers will feed until you move or simply run thru all the bait. Other days they seem to be working the deeper water ledges and you basically have to chase them down catch a few and repeat the process. With the current cold snap, I would have to say the month of January will by far be one of the best months for larger stripers on Lake Texoma. As healthy as our stripers were coming out of the hot summer months I think we are going to see some really good Lake Texoma stripers this winter. I hope all of you had a Merry Christmas and a joyous Holiday Season. With the holidays upon us, find yourself a little time to come out and experience Beautiful Lake Texoma. Have a Happy New Year. 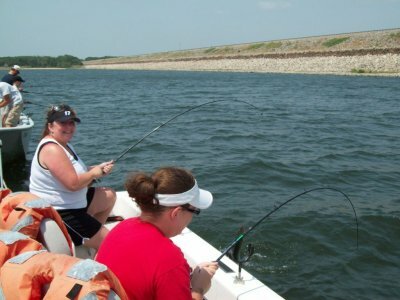 Stay safe and enjoy some great fishing on Lake Texoma. 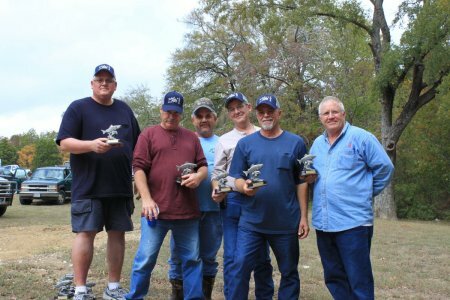 This past October was another great month for Lake Texoma striper fishing. We had our yearly Great White Hunt with Entech on the October 13th. We had 174 fisherman, 36 guides our catering service for the fish fry not to mention a lot of great help. Thanks to everyone that participated. 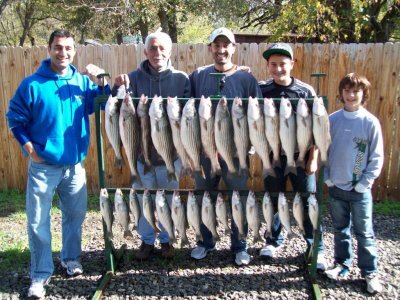 As we move into the middle of November our striper fishing is outstanding.Lake elevation is 612.97 and water temperature is 66 degrees. The sea gulls have moved in by the thousands which helps to locate the feeding stripers. I’m still fishing mainly live bait and fishing the shallow flats drifting or anchor fishing the river channel ledges in 40-55 ft. of water. Morning and afternoon trips we’ve had very good action and starting to see some larger stripers. As far as lure fishing the ghost minnow slabs, sassy shad, cojo minnow and topwater has all worked well fishing with the sea gulls. 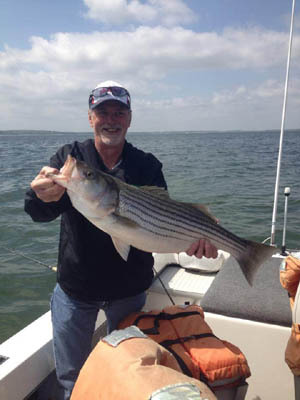 It’s a great time to fish Lake Texoma with the stripers feeding heavily,cooler temperatures and beautiful fall color it makes for a great day. Don’t get too caught up in the action. 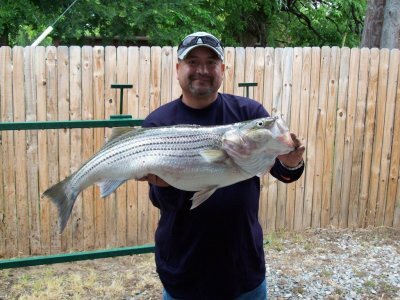 Make sure to measure your stripers as we are starting to see a lot of fish in the 20” range. Lake Texoma lake elevation is 613.94 and water temperature is 74-78 degrees. 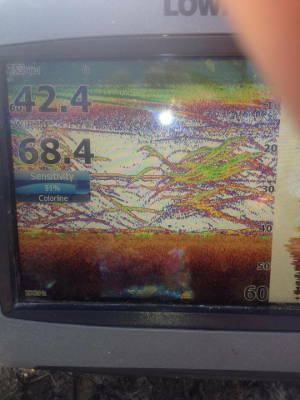 Lake Texoma striper fishing has been pretty consistent. Although we are not seeing the large schools working the surface there is an occasional early topwater bite working shallow flats and points. After that its live bait time fishing working ledges from 25-44 ft of water. Some days I’m able to keep the stripers under the boat for the fast and furious action, others I have to lay several anchors following them as they roam the ledges.With the cooler water temperature we are seeing more of our better fish showing up. October and November are two of my favorite months to fish. 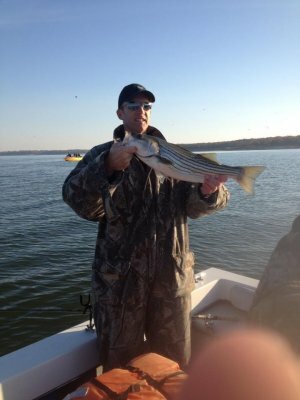 With the cooler weather,fall color and a little less boating traffic and of course big stripers it’s a great time to fish.Hope to see ya out here at Beautiful Lake Texoma. Lake Texoma lake elevation is 617.08 and water temperature is 78-81 degrees. 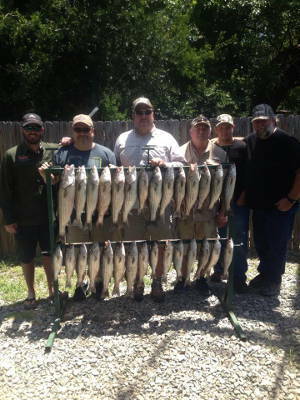 The Lake Texoma striper fishing over the past several weeks has been really good. The larger fish which have spawned are back and are hungry and aggressive. I’m still using live bait fishing mainly deep water (60-80ft) and still working deep water ledges,ditches and humps. Lake Texoma elevation is 618.03 and water temperature is 68 degrees. 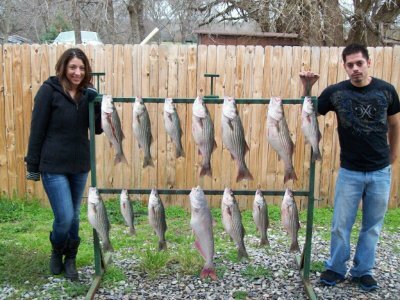 With the mild winter, warmer water temperature and the lake level above normal, I believe that the Lake Texoma striper fishing for 2012 looks to be extremely good. I have mainly fished north of Highport the past couple weeks working river channel ledges from 30-55 feet of water using live bait. Threadfin shad are about as thick as I’ve ever seen them and have already started their spawn along the boat houses and main lake areas along the rocky banks.